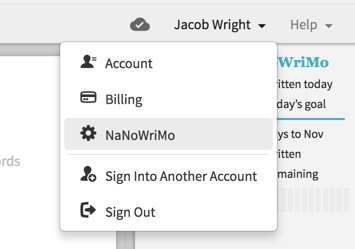 Dabble has a special feature just for NaNoWriMo. 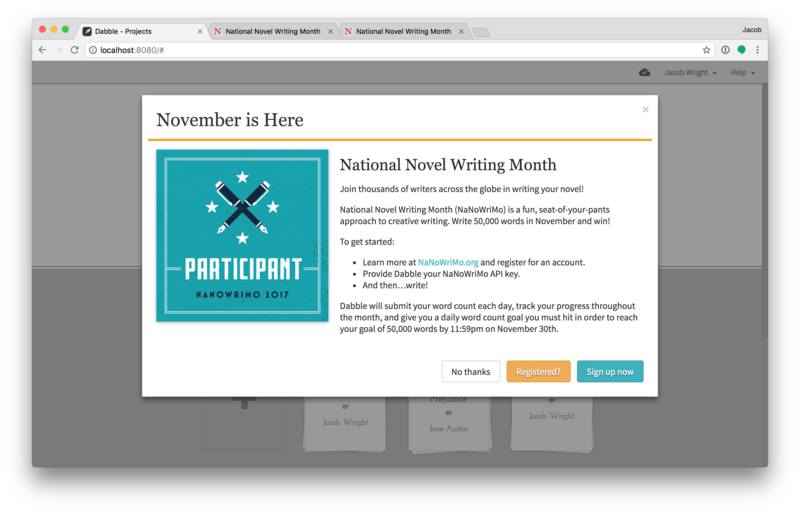 When you log into Dabble, you will be invited to participate in NaNoWriMo up to a month before the big event. You can click on “Sign up now” to be taken to the NaNoWriMo website for registration. After registration (or if you already registered) click “Registered?” to move onto setup. If you decline with “No thank” Dabble will not ask you anymore about participating this year. If you change your mind, you can open this invite back up by clicking on your account menu (top-right) and choosing the “NaNoWriMo” menu item. 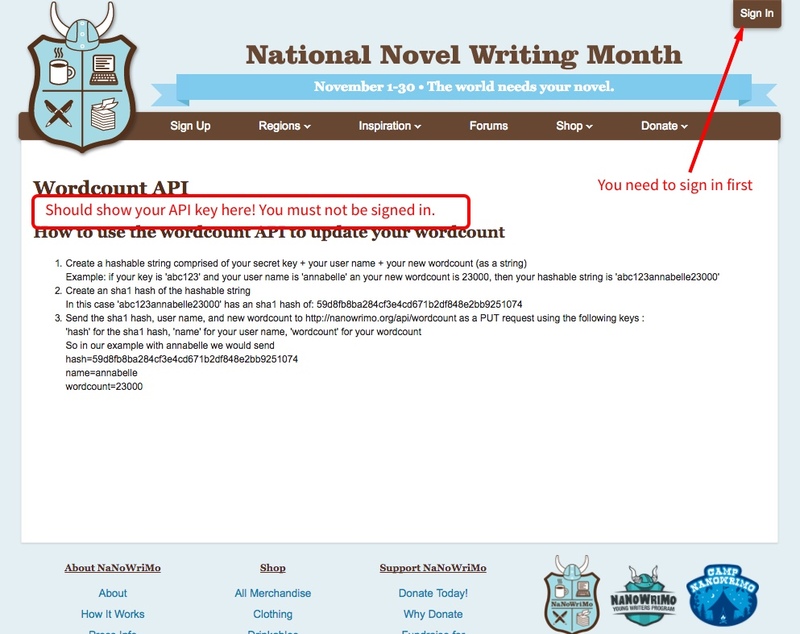 Enter your NaNoWriMo API key found on the NaNoWriMo website at this URL: https://nanowrimo.org/api/wordcount. This API key is specific to you and should only be shared with trusted apps. 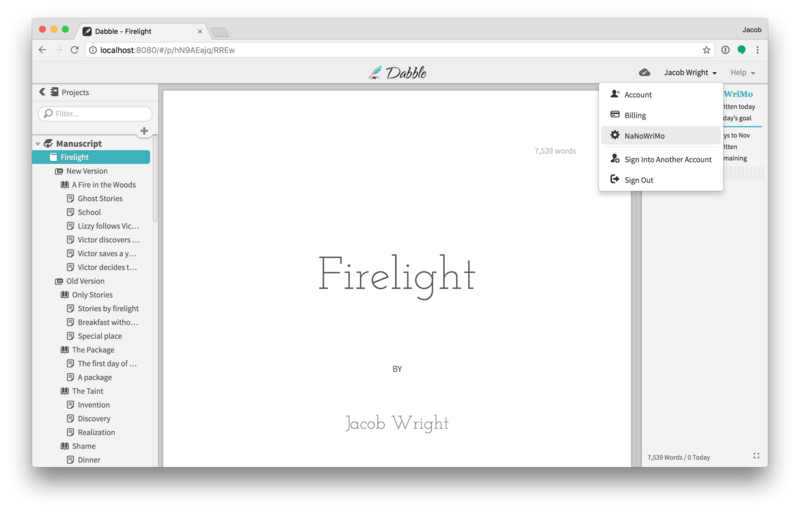 Using this key, Dabble will be able to automatically update your word count. Choose which Dabble project/work-in-progress will be your NaNoWriMo novel. If you have not created this yet, you can close the NaNoWriMo Setup dialog and create it, then go back to the setup by clicking on your account menu (top-right) and choosing "NaNoWriMo". Register your novel on the NaNoWriMo website if you have not already done so. After you enter your API key, Dabble will load your registered novel information and if you don't have it, will ask you to register a novel. Once you are all setup, continue to the goal settings. Dabble calculates your target daily word count during the month of NaNoWriMo. To do this accurately, Dabble needs to know your target word count (by default this is 50,000) and how many working days you have left. If you know you will not be able to write on a given day or two, you can mark those days off. In the NaNoWriMo Goals dialog, click on days during the month to toggle them on or off. This will affect your daily word count to be more accurate. You can also enter your own custom word count goal here. Once you are all set up, you will see Dabble’s NaNoWriMo tracker in the right-hand column of your project when your NaNoWriMo project is selected. You will not see it in your other projects. The tracker will show you today’s goal and how many words you have written today in the top section. Below the line you will see how many days are left, total words written, and total remaining. Below the stats is a simple bar-chart for visualizing your words written during the month, highlighting today in blue. Mouse over the bars to see a tooltip with historical word count. If you want to have a more aggressive goal at the beginning of the month to account for unplanned slow days later, you can mark some days off at the end of the month in NaNoWriMo Goals (e.g. take the whole last week off) and then unmark them when it gets closer. How do I remove it after NaNoWriMo? 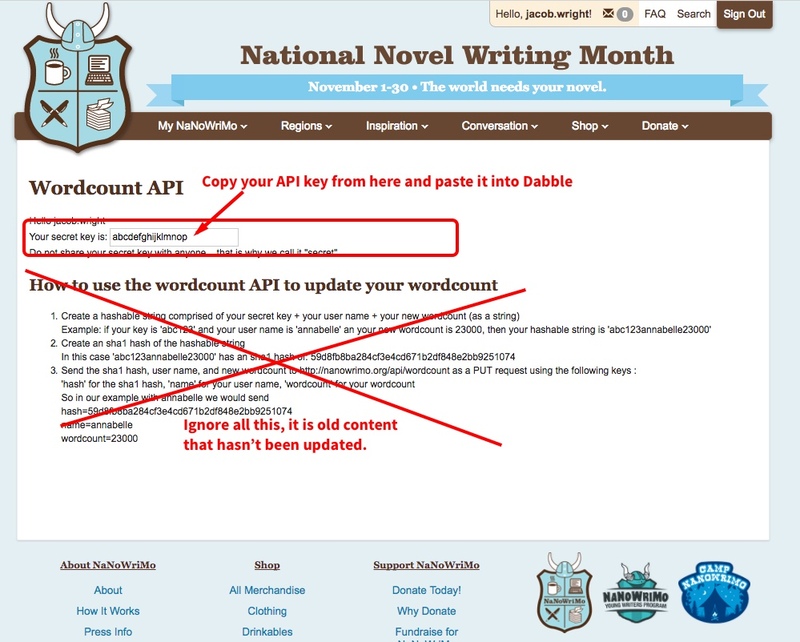 The NaNoWriMo sidebar, menu item, and settings will automatically be removed 15 days after NaNoWriMo is finished. It is only available during/around the event and will not bother you all year long. 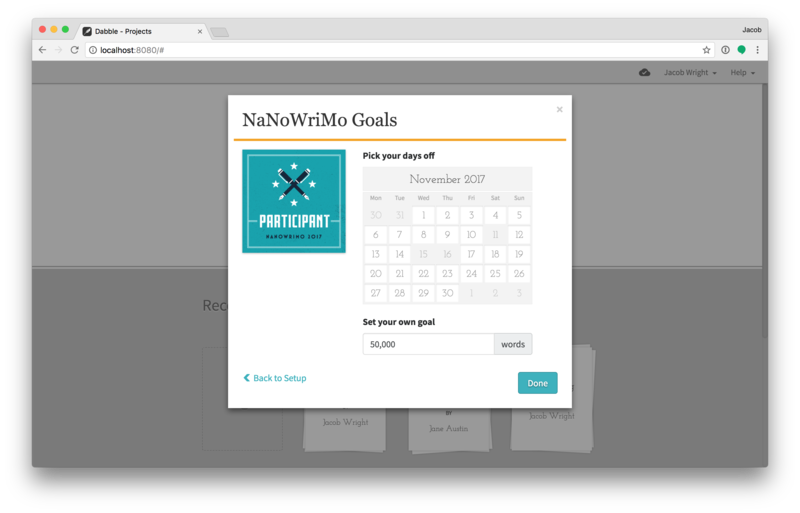 We will work on adding a generic goal setting tool similar to the one we have built for NaNoWriMo. You can continue writing offline and the word count will be updated once you are online. I you spent the day writing offline and didn't get online until the next day (or week), and if you want to ensure the days are correct for your NaNoWriMo submission, you may have to fix it manually. You can see exactly how many words were written each day by hovering over the bars in the graph in the right sidebar. We are unable to backdate the word submission to the correct day at this time because the NaNoWriMo connection does not allow us, even though we accurately track which day the words were written. I wrote over midnight, which day are my words counted for? Dabble tracks your words by session and by day. It will split your words accurately at the midnight boundary for NaNoWriMo, and in the future when we have more stats, we will be able to show information about words written by session or other metrics. Help! I can't find my API key! When you click on the link to find your API key, you may not see it. This can be a bit frustrating, but don't worry, you just aren't logged in. Just click on "Sign In", then after signing in go back to that page with your API key (you may need to hit refresh as the browser can cash the page). Once you are signed in, you can copy your API key and paste it into Dabble's NaNoWriMo settings.